Good morning and welcome to my blog. Thank you for taking time to visit me here and for all of the kind comments you leave, they mean so much to me. Regulars will know that my dear friend and DT team mate Lisette, aka Mrs Beez, has decided that all of her projects this month will feature a butterfly. By doing this, Lisette is hoping to raise awareness of work of the charity Amy and Friends and all that they do to support children suffering from Cockayne Syndrome. I should mention that Amy and Friends adopted the butterfly to represent those whose lives have been cut short by this terrible illness. 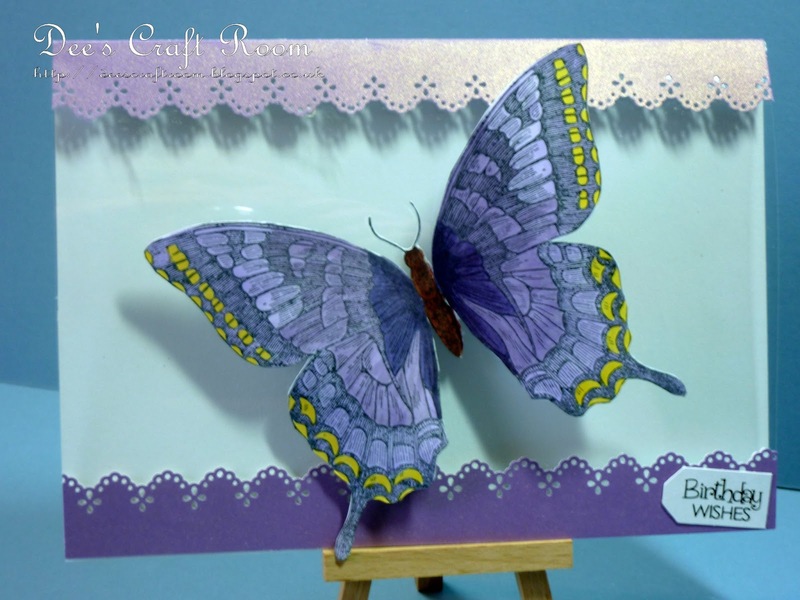 Lisette suggested that she also features some of my butterfly cards on her blog during this month, I was so thrilled about this idea and rushed off to make a stack of cards, many of which feature this fabulous swallowtail butterfly from Stampin' Up. I took my inspiration for this card from Shirley Bee's Stamping Stuff. I stamped the butterfly twice and coloured both identically with my Promarkers. I then cut them out and glued them back to back. Once it was dry I carefully curved and raised the wings. I made the card from a sheet of pearlised card and half a sheet of acetate. I cut the card and punched the edges with a Martha Stewart punch. I attached the butterfly by the body to the front of the card. I also put this stamp onto a candle. I really enjoy adding stamped images to candles and it is so easy to do. Simply stamp your image onto tissue paper, I coloured mine with Promarkers, then, after roughly cutting out the image, place it onto your candle. Cut a strip of baking parchment to wrap around the candle. Use your heat gun to gently melt the skin of the candle and watch the tissue disappear into the molten wax. Take care not to over heat the wax, you do not want it to run. The wax will quickly set again once you remove the heat. I finished the candle by adding some ribbon from my stash. They say that the camera never lies, but my ribbon matches the colour of the butterfly in reality, but you would not think so from the photograph. Please visit Mrs Beez's blog to find out more about the work of Amy and Friends and, whilst you are there, don't forget to check out her fabulous blog candy giveaway. WOW, loving this matching set,Dionne!! 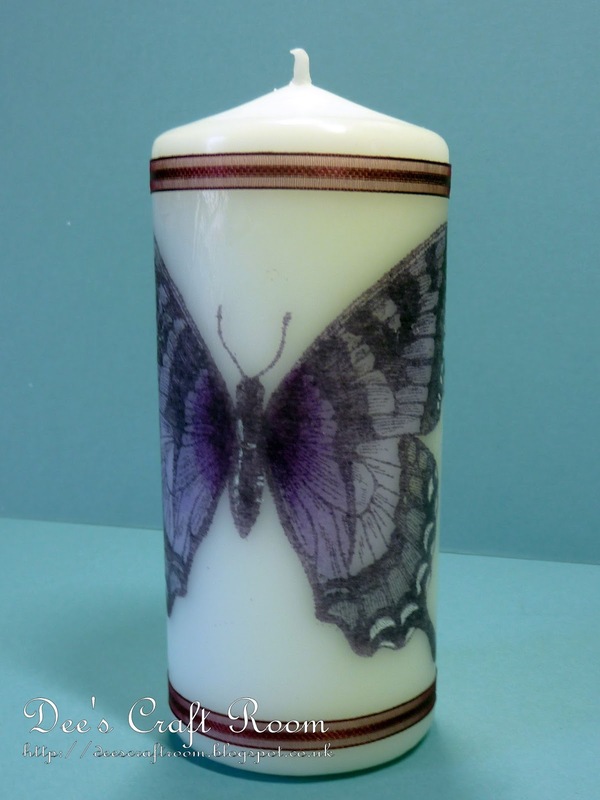 You are getting quite a high crafty mileage using this fab butterfly. Love your promakering as well.... fantastic work.